To bring more warmth into the living space, many homeowners choose to install either wood or gas fireplaces. Both the snapping and crackling of burning wood are comforting and soothing. Plus, the smell of wood burning is invigorating after coming inside on a cold day. However, the ease of turning on a gas fireplace with a flick of a switch has benefits as well. In the sections below, we explain the differences between the two so that you can make an informed choice for your home and lifestyle. There are differences in starting a wood-burning fire versus a gas-burning fire. For a wood fire, the first step consists of leaving a bed of ashes 1 to 2 inches thick from the last fire. This makes the fire hotter and insulates the fire box. The next step consists of removing any blockages in the chimney because this will fill a room with smoke quickly from a lit fire. After laying the fire, the damper must be opened and the flue 1 primed before finally lighting the fire. For a gas-burning fire, the first step is to check for cleanliness and debris. Foreign material will catch on fire if this isn’t done. To light the fire, simply turn on the ignition switch. Energy-efficiency is important when considering the type of fireplace to choose, and there can be a striking difference. A traditional wood-burning, open-masonry fireplace is inefficient for heating a room, on average 10%. There can even be a negative efficiency if a room is poorly insulated. In this case, the chimney brings cold air into the home by drafting it through gaps in the insulation. A gas fireplace, on the other hand, is much more efficient. A one-pipe vent fireplace provides a 50% efficiency rating while the two-pipe vent model has efficiency ratings of around 70%. However, if a direct-vent gas fireplace is installed, it can produce a 90% efficiency rating. Of the two, the wood burning fireplace is more challenging to install because it requires a chimney as opposed to installing only a vent pipe for a gas fireplace. Professional installation is required for either type of fireplace. Installing a wood-burning fireplace takes the skills of a stone mason if a chimney and firebox 2 aren’t already built. If the fireplace is made from stone, then firebricks 3 will need to be installed into the firebox for extra protection. Also, a chimney cap is needed and perhaps a mantel 4. A gas fireplace requires the installation of a small exhaust pipe 5 for venting. Also, if there isn’t a gas line already in place, then it will need to be installed by a certified expert. If the homeowner wants a gas fireplace blower 6, then that will need to be installed as well. There is a difference in cost between wood-burning and gas fireplaces. A brick wood-burning fireplace can range from $5,500 to $11,000 for labor and materials without installation. 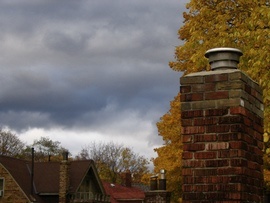 Installation can range from $2,500 to $10,000 depending upon whether if there is a chimney in place. This cost ranges from $60 to $95 a linear foot. Installing a new firebox is between $500 and $1,000. Therefore, the total cost for a wood burning fireplace ranges between $8,500 and $22,000. A pre-built gas burning fireplace can range from $1,500 to $3,000 for the materials and fireplace. A small gas exhaust pipe can range from $500 and $1,000 for cost and installation. For installation of the gas burning fireplace components, the cost can range from $1,500 to $3,000. The price of a gas line hookup installed on an existing line is between $150 and $300. If a new line needs to be run, then the cost will be from $300 to $800. The total cost is between $3,650 and $7,800. Also, consider the price of the wood that will be burned. A cord of wood can cost between $200 and $600. The price varies by region. But a gas fireplace will increase the monthly gas bill. Wood burning fireplaces are more challenging to maintain because of cleaning the soot and removing ashes and any logs that didn’t burn. Also, there is the problem of removing the creosote, which is soot buildup in the chimney. If it isn’t cleaned out, there is the possibility of a flue 1 fire. Applying an anti-creosote spray before a fire is lit can help prevent this between cleanings. Plus, when the fireplace is being shut down for the season, it's advisable to have the chimney cleaned and inspected by a professional chimney cleaner. A gas-burning fireplace, on the other hand, has lower maintenance issues, although the vent pipe needs to be inspected yearly. It won't have a buildup of creosote, but it can collect an accumulation of debris. Also, valves and connections could develop leaks, the thermocouple and thermopile may need cleaning, or the ceramic logs may not work correctly. Sometimes appearance can make all the difference when making a decision. For instance, a wood-burning fireplace can give a homey, warm feeling and add a touch of elegance to a room or home. With the added wood box for storing wood, it adds to the ambiance of the room. In comparison, a gas fireplace does have the dancing flames, quiet glow, and appearance of a real fire. It won’t blend into the walls of your home without being in an old-style fireplace, but it does come in many decorative styles and shapes. Wood fireplaces provide a natural experience because of the smell and the noise of the logs crackling. For many people, this is their favorite feature and the reason why they choose wood over gas. 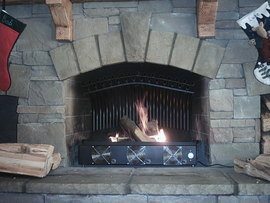 A gas fireplace gives the ambiance of glowing logs and dancing flames, but there is no sound unless artificially added. But gas fireplaces don’t leave odors on clothes like wood fireplaces. With wood-burning fireplaces, it's unsafe to leave a fire unattended. Even when ashes seem to be cold and the fire has died out, a fire can start from a hidden ember. Another issue is the glass doors on gas fireplaces can reach 400 degrees, requiring 45 minutes to cool down enough to touch. A childproof screen should be installed if there are young children in the home. If there is a functioning fireplace in your home, keep it. Although gas burning fireplaces are the favorite, wood-burning fireplaces have their place also. Younger buyers prefer gas fireplaces, but older buyers prefer wood-burning. Whichever one is in the home, it will increase the resale value. Gas-fueled fireplaces are more environmentally friendly than wood-burning fireplaces. The EPA estimates that gas fireplaces emit 99% fewer particles than wood burners. Also, even the pleasant aroma of burning wood can be environmental and health hazards. Some cities have no-burn regulations at various times. How much does it cost to install a wood-burning or gas fireplace in my city? Cost to install a wood-burning or gas fireplace varies greatly by region (and even by zip code). To get free estimates from local contractors, please indicate yours. A decorative construction that frames the opening of a fireplace. 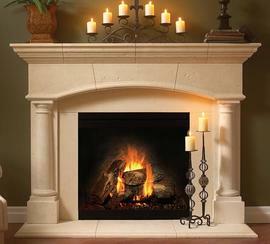 The term \"mantel\" can also refer to a shelf above a fireplace. Cost Considerations: Adding a mantel can increase the installation cost by $800 to $3,000. Cost Considerations: An exhaust vent for a gas fireplace can cost from $500 to $1,000, which is much cheaper than a chimney for a wood-burning fireplace. Installing a wood-burning fireplace and chimney can cost upwards of $8,000.